Private company to manufacture satellites for India. At the recent Farnborough International Airshow that took place outside London, Dauria Aerospace, Russia’s first commercial satellite manufacturer, signed its first international contract, with Indian company Aniara Communications. The contract covers the design and production of two small geostationary satellites. "The signing of the agreement between Dauria Aerospace and the Indian company is an important step for the newly emerging space economy in Russia,” said Denis Lyskov, deputy head of the Russian Federal Space Agency, Denis Lyskov, commenting on the deal. Dauria produces small satellite platforms that weigh less than a ton and can be positioned using electric motors. These features make the satellites affordable for small market players. Dauria’s Perseus satellites remotely determine the type, dimensions, course and other data of maritime and river vessels. Dauria also produces a slightly bigger satellite, the DX1, which provides a stronger and more stable signal than the Perseus. 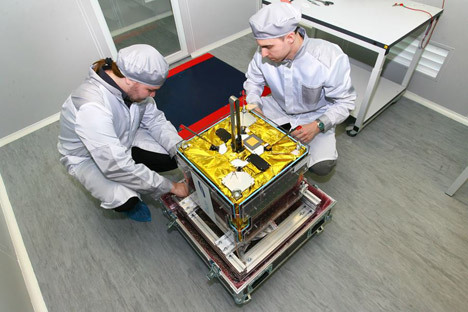 In December 2012, a subsidiary of Dauria Aerospace signed a contract with Roskosmos worth 315 million rubles for the engineering development project Kubsat Nano. Under this contract, a low-cost nanosatellite for remote sensing of the Earth with an optical system that can capture images with a resolution of 10–50 meters is planned to be developed. A study by consulting agency Euroconsult showed that in 2013, the market for satellite images was worth $1.5 billion. According to DigitalGlobe, the emerging market for high-resolution images will add another $400 million to this figure.